BANG! 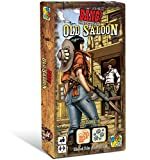 is a shootout game, in Spaghetti Western style, between a group of Outlaws and the Sheriff, who is their primary target. The Deputies incognitos help the Sheriff, but there is also a Renegade pursuing his own goal! In BANG! each player plays one of these roles, and represents a famous Wild West inspired character. Sheriff: must eliminate all the Outlaws and the Renegade, to protect law and order. Outlaws: they would like to kill the Sheriff, but they have no scruples " about eliminating each other to gain rewards! Deputies: they help and protect the Sheriff, and share his same goal, W at all costs! Renegade: he wants to be the new Sheriff; his goal is to be the last character in play. (Before the first game remove carefully the bullet tokens from their frames). Each player takes a playing board (place it in front of you to hold your role, your character, your weapon and your bullets). Shuffle the cards reveals himself by turning his card face up. All other players look at their role but keep it secret. Shuffle the characters and give one face up to each player. Each player now announces the name of his character and reads his ability. Each player takes as many bullets as shown on his character. 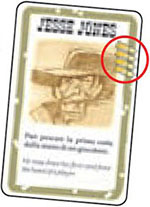 The Sheriff plays the game with one additional bullet: if his character card shows three bullets, he is considered for all effects to have four; if he has four bullets, then the Sheriff plays with five. Put the remaining roles, boards and character cards back in the box. Shuffle the playing cards, and give each player as many cards, face down, as the bullets he has. Put the remaining playing cards face down in the middle of the table, as a draw pile. Leave room for the discard pile. Note: for your first few games, you can try a simplified version of the game by removing all cards with the symbol of a book before getting started. Each Western character has some special abilities, which make you unique. The bullets you have show how many life points you begin the game with, i.e. how many times you can be hit before being eliminated from play. Moreover, the bullets indicate how many cards the player can hold in his hand at the end of his turn (hand size limit). Example: Jesse Jones has 4 life points: he can be hit four times before being eliminated from the game. Moreover, he can hold up to four cards in his hands at the end of his turn. If during game Jesse loses one life point and he is down at 3, he can only hold up to three cards in his hand at the end of his turn. But fear not! Life points can be recovered! Draw the top two cards from the draw pile. As soon as the draw pile is empty, shuffle the discard pile to create a new playing deck. 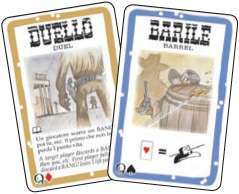 Example: If you put a Barrel in play, you cannot play another one, since you would end up having two copies of the same card in front of you. There are two types of cards: brown-bordered cards (= play and discard) and blue-bordered cards (= weapons and other objects). Brown-bordered cards are played by putting them directly into the discard pile and applying the effect described with text or with symbols on the cards (illustrated in the next paragraphs). Blue-bordered cards are played face up in front of you (exception: Jail). Blue cards in front of you are hence defined to be "in play". The effect of these cards lasts until they are discarded or removed somehow (e.g. through the play of a Cat Balou), or a special event occurs (e.g. in the case of Dynamite). There is no limit on the cards you can have in front of you provided that they do not share the same name. Once the second phase is over (you do not want to or cannot play any more cards), then you must discard from your hand any cards exceeding your hand-size limit. Remember that your hand size limit, at the end of your turn, is equal to the number of bullets (i.e. life points) you currently have. 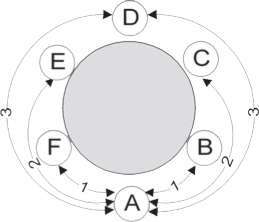 The distance between two players is the minimum number of places between them, counting clockwise or counter- clockwise (see figure). The distance is very important, because all cards with a sight take it into account. 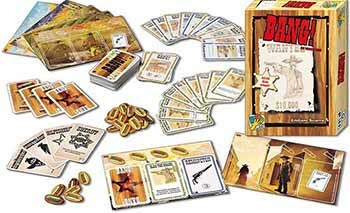 Normally you can reach only targets (players or cards) within a distance of 1 (note the of your Colt .45 on your playing board). When a character is eliminated, he is no longer counted when evaluating the distance: some players will get "closer" when someone is eliminated. When you lose your last life point, you are eliminated and your game is over, unless you immediately play a Beer (see below). When you are eliminated from the game, show your role card and discard all the cards you have in hand and in play. If the Sheriff eliminates a Deputy, the Sheriff must discard all the cards he has in hand and in play. Any player eliminating an Outlaw (even if the eliminating player is himself an Outlaw!) must draw a reward of 3 cards from the deck. all the Outlaws and the Renegade are killed. The Sheriff and his Deputies win. Example 1: All the Outlaws are eliminated, but the Renegade is still in play. In this case, the game continues. The Renegade must now face the Sheriff and his Deputies alone. Example 2: The Sheriff is killed, but all Outlaws are eliminated, and one Deputy and the Renegade are still in play. The game ends with the Outlaws winning! They achieved their goal at the cost of their own lives! If you play more than one game in a row, players still "alive" at the end of the game may choose to keep their character (but not the cards in hand or in play!) for the following game; players which have been eliminated must draw a new character randomly. If you want to give each player the opportunity of playing the Sheriff, you may decide, before starting the game, to pass this role among players from game to game, randomly assigning the other roles. 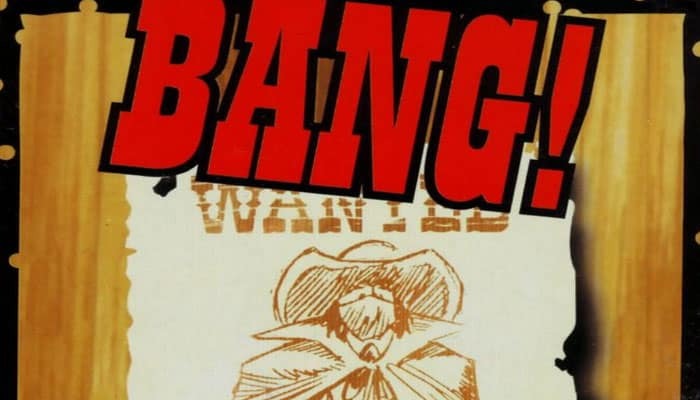 Now that you are familiar with the rules, let's see the cards of BANG! in detail! when you are losing your last life point, you can only play a Beer, and not a Saloon. In order to keep track of your life points, you can use another character card, from the ones left over. Turn it face down and cover / uncover the bullets by sliding your character card on it, just like in the picture. This makes easier to bring BANG! with you and play it anywhere! Jesse Jones with three life points.